GO ON THE JOURNEY OF A LIFETIME WITH THE ASPEN TRAIL. 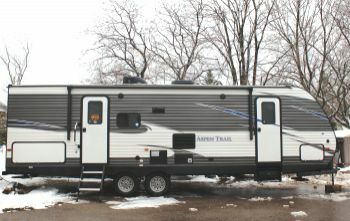 With a name that reminds you of beautiful mountain vistas and once in a lifetime excursions, the Aspen Trail is one travel trailer that lives up to its name, then exceeds all expectations. With the Aspen Trail, you'll journey with wall to wall interior features, like an under mount farm style sink, 3 burner range with oven, high output furnace, real maple hardwood doors and drawers, and 82" interior ceiling height. Plus, you'll have peace of mind in any location with mega pass-through storage that has over sized baggage doors on both sides, a heated and enclosed underbelly and seamless one piece roof. The only thing the Aspen Trail can't do is plan your next adventure...but it can try. Very kind staff..people all around very friendly. All around a great place to relax.